Kate has shared her Greased Lightning cleaner review. My husband needed a multi purpose cleaner to clean his tools and tool box. Instead of giving him my good cleaners, I bought him a bottle of Greased Lightning because it was cheaper than the cleaners I used. It worked very well on his tools and tool box. Then he used it to clean the wheels and tires on the car. Again, it worked well. Later on, while I was at work, he decided to clean the range top with the product. There were a few burned on stains. He soaked the stains, then waited a few minutes and scrubbed them off. When I got home the range looked so good that I asked how he had cleaned it. I was surprised when he said, "Greased Lightning." Since it had worked so well on everything else I decided to try it on the filter bars of my air purifier. The filter bars get really dirty, and take a lot of scrubbing to clean. I sprayed the bars with it and I could see the stains dissolving. Greased Lightning has replaced a lot of my expensive "name brand" cleaners because it works so well. It really is an all purpose cleaner. 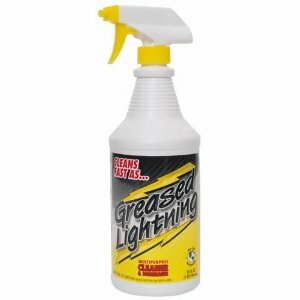 Thanks Kate for your review of Greased Lightning cleaner. I had not really heard too much about this product before you told me about it, and so I did a little research on it. The multipurpose cleaner actually is designed to clean a lot of different surfaces in your home, including laundry, carpet, and hard surfaces. It is also designed to cut both grease, since it is a degreaser, and also other dirt and grime. It is advertised as able to clean such varying objects in your home such as your dirty oven, microwave, kitchen hoods and vents, mildew stains in your bathroom, and even your patio furniture. That is quite a range! I would love to hear from others, either in the comments, or in their own review telling me about your uses for Greased Lightning cleaner, and how it has worked for you, either good or bad. You can share your general purpose cleaner review here, telling me what you like, or don't, about it and why. In addition, you can share your cleaner degreaser review here, for this or another product, or read other reviews already submitted.